Now that we’ve discussed “what” the first chakra is (see preceding post) let’s jump in and have its experience. Very different from learning about it, hearing of it. This energy center is located at the base of your spine. Please focus your attention there. Sense the connectedness of your bony spine’s very end, not as bone though, but as if it’s made out of loose, moving, flexible “energy fibers” … tentacles, extensions of your very essence. These energy fibers grow when you focus on them. The invisible tentacles that come from your lower spine, its very tip, the coccyx, and the surrounding wider sacrum area (all are the 1st chakra area) — are like fibers or strings of energy that you see arising from bolts, or other sources of intensely accumulated electricity (another mostly invisible source of energy). These “imagined” glowing fibers emanating from your sacrum grow toward an attracting source. In this journey of understanding human spirituality that the chakras help us understand, your own body’s 1st chakra tentacles reach out for the very center of the Earth — from whence we came. The word for “human” comes from the same etymological source as “humus” — which is defined as “the material of earth itself.” Humus is what is found on the floor of the forest or jungle, after plant material has fallen to the ground and accumulates in layers. Humus occurs, then, when living material is in the process of going back to the source from which it came: Earth itself. In the same manner, you and I, we are children, offspring (like living plants are) of the Earth. We are as well, children of the Divine Energy toward which we all aspire to feel connected to (this will happen when we dwell in the 7th, the “crown chakra”). All humans originate from the Source Itself — Consciousness. This is why children are so much more open and magical than older humans. Because children are simply closer to the Source from whence we all come. And a person who is dying, likewise, if they are settled in their hearts, are filled with wondrous anticipation, not dread, when they have glimpsed where they are now headed — back to the Source of All. I know this from my own personal experience, having helped both my parents return to the Source. Let’s continue experiencing this 1st chakra energy together, shall we? Sit (or stand, or lie down, it doesn’t matter) anytime you wish, and focus on this energy that connects you to our home, planet Earth. Your 1st chakra’s energy fibers anchor you, always reminding you … who you are. This “I am” … is the mental thought that corresponds with 1st chakra awareness, or consciousness. This awareness my friend described is the most basic of the great I am consciousness. To connect with this most basic of energy is easy and simple. All you have to do is want to experience your most essential “I am” quality — which is — that you are alive! And you are alive as long as you have breath in you. Breath, therefore, is key to consciousness. The 1st chakra energy is about survival. Not only does this energy help us experience our very essence, our alive-ness, but it propels us to stay alive! If you are in a coma, obviously you are dependent on others to feed you, keep you breathing, keep you comfortably warm or cool, and expel all the toxins from your system. I’ve seen the tubes containing these toxins that if modern medicine didn’t take care of, surely would kill a comatose patient within a short while. Here’s how: breathe in, and in a natural tone sound out … Lammmmm … as you slowly breathe out. Breath in, and again breathe out toning Lammmm, on and on. As we journey up the chakras, each energy center has its own corresponding mantra. Where these ancient sacred sounds, like Lam, came from, I do not know. All I know is that my masterful spiritual teacher taught them to me, and … I’ve found them useful in my understanding of my own spirituality. Mantras are just tools by which we can focus our attention on certain aspects of our spiritual development. And the more ancient they are, the more a mantra contains the sacred energy called Shakti. That’s why I recommend using Lammmmm for additional help connecting to your 1st chakra. If you’re a visual person as I am, it’s also useful to envision the color Red when you concentrate on the 1st chakra energy. Again, just another tool. As we ascend the chakras, we’ll be traveling the colors of the rainbow (red, orange, yellow, green, light blue, indigo, and finally … white). It was the ancients who ascribed colors as well as mantras to these energy centers. They noticed everywhere, all around them, how light fragments into the prismatic colors, as rainbows do in the sky above us. As pure white light (the color of the crown, the uppermost chakra) separates, the prismatic colors of the rainbow become apparent. When all light is connected, we see white (or “clear” transparency). You can notice this in how every drop of rain water, every dew drop, every minuscule source of water breaks into its own tiny prism. Check it out. Go to a spider’s web on a dewy morning, and look closely at one drop of dew that’s been caught there. Go closer. You will see the rainbow within that drop. I hope our experience of the 1st chakra is useful for your understanding of how to raise up our consciousness, the purpose of a person’s exploring their own level of awareness. Please leave me a comment below, subscribe to my blog, and stay in touch! I’d love to hear from you, whether you agree or disagree with my offering. I cherish your opinion. 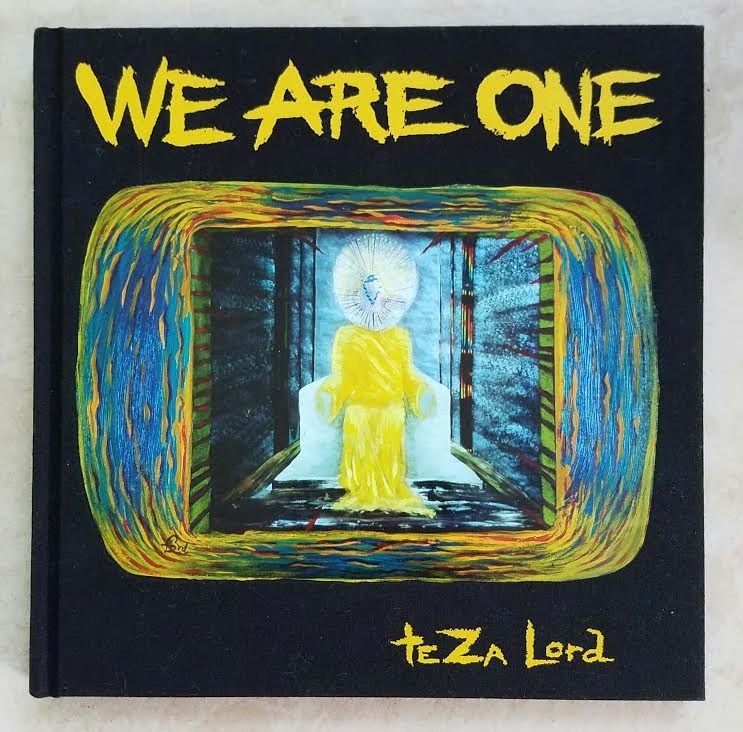 If you wish, check out my visionary artbook “We Are ONE” at Amazon. Thanks. love from your pal teZa Lord, aka Lord Flea.